At Islands Framing, we offer a wide range of specialty framing services along with expert advice to help you select the perfect frame and matte to compliment your artwork. Inspiration and collaboration are at the heart of everything we do. Your classic art, family treasures and precious memories all deserve to be preserved at the highest quality that the framing industry has to offer. At Islands Framing we are experts in preserving your precious art using a wide range of color and textures, acid-free, conservation mattes and conservation, non-glare or museum glass. If you don’t see what you’re looking for or want a signature frame, we can create a custom look just for you. We love a good challenge! Upon entering Islands Framing, you are greeted with hundreds of moldings and matting choices. Please don’t feel overwhelmed by the infinite possibilities, as we are here to guide you through the process. Clients can visit us in our studio by walk in or appointment. It’s always helpful to see samples and materials for yourself and talk through the range of options with the expert. We’ll give you and your projects as much time as you need. Sometimes onsite at your home or office is better. We take into consideration every facet of your project, from wall color to complementary furnishings to direct and ambient lighting when building your framing project. Carol Porter Bailey is a true artisan. 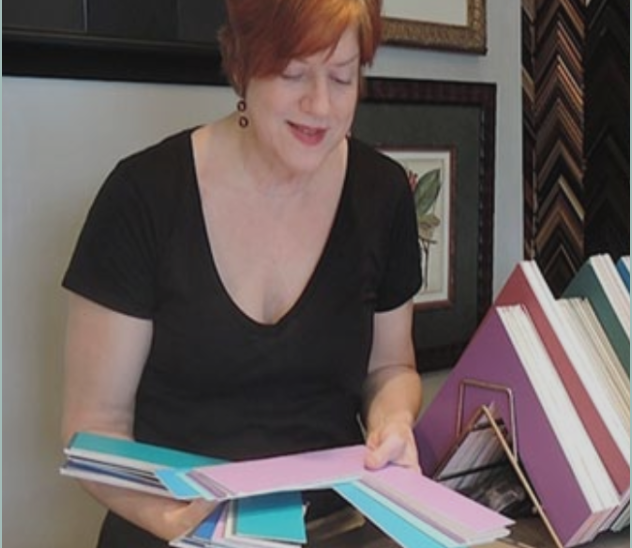 With over 30 years of experience in the framing industry, Carol has developed an unparalleled design expertise in Savannah and the Low Country. True custom picture framing is at the heart of Islands Framing. There are no computer matte cutters in our workshop. Every matte is skillfully cut by hand and every frame is assembled in house, insuring that your valuable art & family treasures are protected and preserved for generations to come. Carol has curated numerous gallery shows and private collections. She can handle any project or installation and our on-site consultation service will take the worry out of hanging everything, beautifully. Her cutting-edge perspective, fresh ideas, and sophisticated approach to design enable her to meet and surpass all your expectations. Beautifully framing your precious works of art is only the beginning. Whether your taste is modern, traditional, or classically ornate, Carol will create framing that reflects your personal style, while enhancing your home or office decor. 714 Mall Blvd. Suite #3, Savannah GA 31406 Mall Village at Waters Ave. and Mall Blvd. Whether at the studio or a custom appointment at your home or office, please reach out so we can get you framed. Thank you for your inquiry. We will get back to you as soon as we can.